Okay, back in the blogging saddle! The Tale of Tales! Matteo Garrone’s 2015 film inspired by stories from Giambattista Basile’s fairy tale collection of the same name. The film stars such talents as Salma Hayek, Toby Jones, John C. Reilly and Vincent Cassel (huh. Cassel was in a surprising number of European fairy tale movies around that time). While Basile’s book was a much longer, more complicated affair featuring a framing structure and five days of stories being told, Garrone’s film is just three tales that sort of touch alone the edges. The first story is about a queen who is so desperate to have a child that she resorts to eating the heart of a giant sea serpent to get it. The second story is about a bored king who becomes preoccupied with raising a flea until it’s the size of a calf. The third story is about a lecherous king and two elderly sisters who will go to great lengths to become his next conquests. This movie is not like most other fairy tale films you’ll see out there. First of all, it’s rated R. In fact, it’s the first R-rated fairy tale movie I’ve ever reviewed/reacted to on Fairy Tale Fandom. And as this is a fairy tale film aimed squarely at adults, he expects the audience to do more work in figuring out what the whole thing is about. In family fairy tale films, the themes are usually outright stated or even sung. However, if you ask me, what Garrone has put together is a fantasy film about the costs of obsession. The obsession with having a child. The obsession with sating one’s own lust. Even the obsession with raising a giant flea. 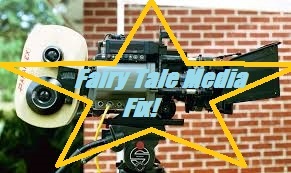 It’s a very different approach for a fairy tale film, focusing instead on characters’ faults and failings rather than on their triumphant “happily ever after”. All of the characters in question make choices related to their obsessions that have unexpected negative consequences for those around them. I’d like to say this movie is a good representation of Basile’s book, but I’m not sure I can. Like I said, the movie cherry-picks certain stories that fit a specific theme. The essence of Basile’s book came through in its framing story and the power of the storytelling depicted therein. Also, Basile’s book had a kind of bawdy, rustic sense of humor to it (I mentioned the use of toilet humor in another post). The movie plays everything about as seriously as a heart attack. Though, the sight of the giant flea is funny in kind of a strange way. The movie itself is fine. The stories are faithful to the originals in content if not always in tone. The actors do a fine job playing their roles. I liked the creature effects for the sea serpent and the giant flea, though I think they could perhaps have been more creative with the ogre they had in one of the stories. I will say that the way the stories changed from scene to scene could leave you a little lost, but maybe the director was just trying to make sure you were paying attention. The Tale of Tales is not a fun movie. I wouldn’t necessarily recommend this for a fun Friday night on the couch. However, it’s also not really a bad movie. It was good enough and interesting enough and different enough that I thought it would be a shame not to have a copy for my own movie collection, if just to use as a reference for future posts. Whether any of you, my faithful readers, will like it is down to personal taste. Four-Color Fairy Tales: Peter Panzerfaust.